Let’s take a look at the graphic to the right and discuss some of the most common problems our ECP Contractor Partners see when they are out on a job. 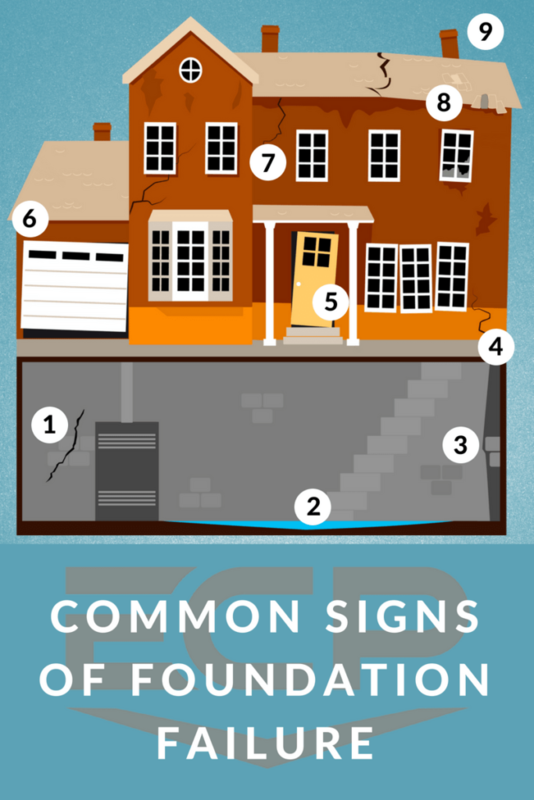 Our contractors can resolve foundation problems caused by all of these signs, and provide a customized solution for all of your waterproofing and foundation repair needs. #1: Basement Wall Cracks and Water Seepage – Water intrusion through cracks in concrete block wall foundations or poured concrete foundations is one of the most common problems we see. Water pressure on exterior walls leads to seepage and can potentially lead to flooding. Also, where water is present, mold and mildew can also be present. This presents a health risk to anyone in the home or business. #2. Flooding or Pooled Water in Basements – Whether flooding is caused by weather or by plumbing issues, it can be a huge problem and can sometimes not be covered by insurance. It is important for home and business owners to understand if they have enough coverage if there is flooding. Proper drainage and interior and exterior waterproofing, as well as properly placed gutters and downspouts, can help. It’s important to make sure the grading around the property leads down and away from the foundation as well. #3. Bowed or Leaning Foundation Walls – Water builds up around foundation walls after heavy rains if proper exterior drainage isn’t present. If this happens it causes hydrostatic pressure. It can cause foundation walls to bow in or even collapse if not dealt with. Foundation walls can be supported by wall repair solutions such as carbon fiber strips or wall anchors and plate anchors. It is important to discuss a solution with an ECP professional to make sure you have the right solution for your type of foundation and the severity of the problem. #4: Exterior Foundation Cracks – It’s a good idea for home and business owners to take a walk around the exterior of their home frequently. Inspect your foundation for cracks on the exterior. Cracks can be repaired before larger problems occur. Some cracks can be filled, but it is very important to have them inspected by an ECP contractor to make sure other problems aren’t present as well. #5: Misaligned Doors and Windows – This is a sign that is commonly overlooked. Many people think they are sticking due to humidity. If you notice changes in how your doors and windows open or how they appear in their frames, you may have a bigger problem. Look for other issues that might be foundation problem indicators or contact an ECP contractor for help. #6. Garage Column Cracks – This is also an often overlooked problem. Check your garage interior and exterior for cracks and the column between your garage doors for problems. Garage doors can also become misaligned and you may notice light coming in beneath them if concrete is sinking in your driveway. ECP has a polyurethane solution called PolyPier to lift and level driveways (and sidewalks, and much more!) See if your ECP contractor to find out if this solution is right for you. #7: Exterior Cracks in Brick and Masonry – While homes and businesses age over time, the exterior may show some wear and tear. Sometimes it is hard to tell what might be related to foundation settlement. If in question contact an ECP contractor for an inspection of exterior cracks and problems. #8: Foundation Settlement & Sloping Floors – If you take a ball and put it on the ground and it rolls away from you, you may have a foundation settlement issue. Uneven and sloping floors and a big indication of foundation settlement. Foundation underpinning solutions including push piers might be a solution you need, and ECP is the leading manufacturer of these types of foundation products. Check with your local ECP contractor for more information. #9: Leaning Chimney – This may mean the foundation is shifting or moving, and the chimney itself might need helical piers for stability. This is a dangerous problem to have and it should be looked into immediately. For any foundation problem count on the manufacturing team at ECP and the ECP network of contractors across the United States to provide you with long-lasting solutions. Contact us for more information!